A missive sent this morning amid the raid at Albany's Occupy the Farm protest said the group would reconvene tomorrow afternoon to plan its next step. But the future is a little hazy for this rogue group of well-intentioned agriculturalists, who spent roughly three weeks tilling two acres of arable land on a parcel owned by UC Berkeley's College of Natural Resources, and commandeering additional space for its makeshift encampment. The protesters argued that the 10 acres at Gill Tract, which contain Class 1 soil, evidently the best kind for growing edible crops. It's currently being allocated for agricultural experiments, many of which involve corn. As of an hour ago, no arrests had been made at Occupy the Farm, the agricultural encampment set up more than two weeks ago at Gill Tract, a university-owned parcel of land at the intersection of Marin and San Pablo Avenues. But a raid may be imminent. Occupiers received dispersal notices and a threat of "chemical agents" at around 6:30 a.m. this morning. They say that UC police also brought a bulldozer to raze the farm and concrete barriers to inhibit vehicle access to the property. 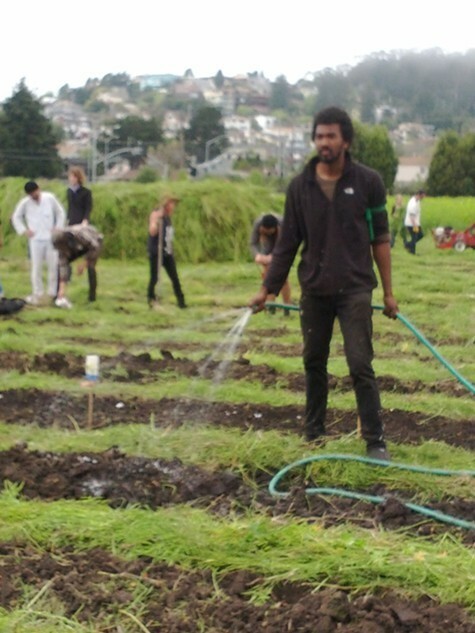 Police say that time has run out for the 200 urban farmers to leave voluntarily, and at this point, UC Berkeley's College of Natural Resources needs the land for research. The foundation of the Occupy movement is that it is a vehicle from which all people can, theoretically, express themselves openly without fear of censorship or the nasty tactics that politics often produces. But the purity of idealistic optimism, however good-intentioned and necessary to improve the current state of things, often runs into the iron wall of reality; there will always be people who use the mechanisms of openness in ways that, unchecked, can become a destructive force for the whole. In an attempt to punish and deter Occupy Oakland protesters, the Alameda County District Attorney’s Office has employed the use of stay-away orders on at least fourteen protesters after the January 28 move-in marches and the subsequent mass arrest of 408 protesters, including journalists. But those stay-away orders are now being challenged in the courts on the grounds that they violate the constitutional rights of protesters, particularly those who have not yet been convicted of any crimes. Brace yourselves! This news may be shocking. The Department of Homeland Security has its eye on Occupy. As part of the recent Wikileaks email dump, a rather benign-sounding newsletter from October 2011 from the department, entitled “SPECIAL COVERAGE: Occupy Wall Street,” explores the movement that has proliferated across the country at an astonishing rate. It recognizes that the “leaderless resistance movement” had managed to create an elaborate communications infrastructure, mainly thanks to social media and online communities, that have allowed the original Occupy Wall Street camp to spread its message, organize events, and sustain its operations. Just a few days after the march to San Quentin prison, Occupy Oakland has redoubled its populist efforts, this time by joining forces with a loose confederation of labor activists — namely, union representatives from UniteHERE Local 2850 — to advocate for worker rights at the Castlewood Country Club in Pleasanton. Two years ago, the club locked out about sixty staff members, including kitchen helpers, bartenders, and janitorial workers, in a dispute over health care. When club management launched contract negotiations with the union in August 2009, it proposed a new plan that would require hefty contributions from workers who'd previously not had to pay: the new fees were $366.93 a month for single policies and to $739.08 for families, which made health care unaffordable for a large swath of club employees. 1. The proposed crackdown on future Occupy Oakland protests at the Port of Oakland failed to garner enough support on the city council apparently because Oakland police brass and port officials quietly opposed the idea, the Chron reports, citing anonymous sources. Oakland police officials are reportedly worried that more violent confrontations with Occupy protesters could push the department into federal receivership. And port officials were concerned that the crackdown measure would prompt more violent confrontations at the port. Although support for Occupy Oakland has nosedived recently in the wake of violent protests, the Oakland City Council made a smart decision last night, rejecting a call for a police crackdown on future demonstrations. 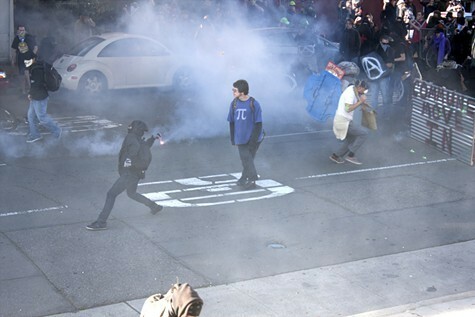 The proposed crackdown likely would have resulted in more violent confrontations between Oakland police and so-called Black Bloc protesters — which is exactly what the violent fringe of Occupy covets.